Welcome to SMSCaster.com. We specialize in SMS messaging software and tools for marketing ! - Now with Responder to auto-reply incoming SMS! “Use your existing Nokia, Sony Ericsson or Motorola mobile phone! It has been a long time since the last release! Today we are glad to announce the release of version 3.7 for both GSM and CDMA version. - The SMSCaster Development Team. Both version 3.6 of GSM and CDMA are released today. It has a new and enhanced Scheduler. All our customers with valid license key are welcome to upgrade for free! We continue to improve SMSCaster and today we're glad to announce the release of GSM Standard and Enterprise. Major features go to Enterprise Editioin, they are: Responder for auto replying incoming SMS, Printing & Print Preview. Hi folks! Today we released version 3.3 for both GSM and CDMA version. Importing contacts from a text CSV file is faster now. It takes just a few seconds to import 100k contacts! You can optioinally remove duplicates phone number also. For the Enterprise Edition, you can optionally enable separate queues for the outbox. Many our customers want to send sms with CDMA phones or CDMA data modems because of unlimited sms plan available in their countries. Now we are glad to announce the support of Huawei CDMA data card (EC321) and USB modem (EC325). The SMS sending speed is encouraging (more...). Support for other CDMA devices are coming soon. We are glad that the latest version 3.0 is released today. Besides a better interface with better graphics, it has contact groups support. You can now divide the contacts into different groups, each contact can belong to more than one group. Other changes include incremental search for contacts, inbox and outbox; auto-complete at the "To number" field. Existing customers are free to upgrade without the need to input the unlock key again. May 31, 2007 - Export received SMS into different format! The latest version 2.10 is released. You can now export received sms as well as sent sms into CSV, CSV (Unicode), Excel and XML file. Find your local reseller for SMSCaster's software to get better support! April 11, 2007 - CDMA Enterprise Edition released! In countries like the United State and Canada, there are already free and unlimit sms plans in CDMA network. We are confident that this is a valuable marketing software for you. February 16, 2007 - SMSCaster E-Marketer v2.9 released. We are glad to announce that the latest version 2.9 of SMSCaster E-Marketer is released. It has built-in scheduling for sending and receiving sms. Three types of schedules are provided: "Fixed Interval", "Once" and "Daily". Also in this version is the official support for iTegno GSM/GPRS modem WM1080A1I and iTegno 3000 for both sending and receiving SMS. January 12, 2007 - SMSCaster E-Marketer CDMA released. In addition to supporting GSM devices, we have accomplished the support of sending bulk SMS with CDMA phones. 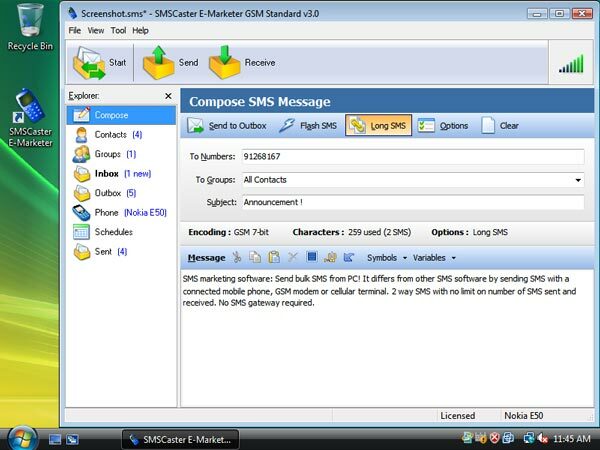 "SMSCaster E-Marketer CDMA" is released as a separate version. Currently Nokia 2865, 3105, 3155, 6155, 6165, 6235, 6236, 6255, 6256, 6265, 6275 or these models with i are supported. December 13, 2006 - SMSCaster E-Marketer v2.8 released. Version 2.8 of both editions are released today. This version supports SMS command line interface for controlling and automating SMSCaster. It also supports Unicode file name. Existing customers are free to upgrade to this version. November 16, 2006 - SMSCaster E-Marketer Enterprise v2.7 released. We're glad that the long waited enterprise edition is released today. The enterprise edition supports sending SMS with multiple phones simultaneously. There is no limit on number of phones it can connect. The only limitation is from USB and COM port physical connection. November 14, 2006 - SMSCaster E-Marketer Standard v2.7 released. SMSCaster E-Marketer will be split into two editions: The standard edition and the enterprise edition. Existing customers who order version 2.6 or before are free to upgrade to v2.7 standard edition. Just download and install v2.7 over the previous one and the unlock key will continue working automatically. Major enhancements include: support for old serial data cable; a new phone information page which allows easy phone selection; a "Phone Events" dialog showing all kinds of error during transmission. October 11, 2006 - Web site in Chinese. Our web site in Chinese is launched at SMSCaster Hong Kong. We now accept payment in Hong Kong dollars by bank deposit or paypal. October 6, 2006 - SMSCaster E-Marketer v2.6 released. This version features mainly an addition of an "Inbox" and the functionality of receiving SMS. You can now receive reply from the recipients of your marketing campaign! Existing customers are free to upgrade. Just install the new version 2.6 over the previous one and there's no need to enter a new activation code. October 1, 2006 - License fee starts at $29.95. A more flexible license scheme based on time period is available. It starts at $29.95 for one month up to $180 for perpetual license. This applies to both licensing models: per computer license and per phone license. Good news! Our next version v2.6, which is capable of receiving SMS from mobile phone, is about to release in a week. September 15, 2006 - A new USB data cable driver download page. We have prepared a free driver download page for USB data cable of major mobile phones to facilitate you in connecting your mobile phone to the computer. It will be updated from time to time and more brands will be added. Currently there are Nokia connectivity cable driver, Driver Tool by Motorola, Driver from Prolific PL-2303 USB to Serial Bridge and Samsung PC Studio 3 USB Driver Installer. July 28, 2006 - SMSCaster E-Marketer v2.5 released. This version is mainly for a new licensing model - per phone license. It allows you to use the same mobile phone with several computers for the same license. Plus we offer 20% discount on this per phone license initially. Existing customers will need a new unlock key for this version and it's free to do so. Just send us an email to request for that ! June 23, 2006 - SMSCaster E-Marketer v2.4 released. We are glad to announce the release of a new version of SMSCaster E-Marketer v2.4. All our existing customers are free to upgrade. The serial number should remain unchanged. The latest version has lots of new functionality and improvement. - Variable support in outgoing SMS, like recipient name, phone number and 5 user-define fields. - Import & Export Wizard for contact list. - More functionalities in the SMS editor, like Compact & Undo. - Option to retry on +CMS ERROR, which happens when some mobile phones cannot handle task simultaneously. - New look & better user interface. March 9, 2006 - SMSCaster E-Marketer v2.3 released. - Support for long SMS. - More configurable options like SMS centre. - Auto COM port detection. - Better user interface in composing message. - Some minor improvement and bug fix. All our existing customers are encourage to download and upgrade for free ! January 27, 2006 - SMSCaster E-Marketer released. We are proud to announce that SMSCaster E-Marketer 2 is released and available for download today. We hope you guys would give it a try and provide some feedback to us. We are going to put more effort in this product in the coming months. We have set up a discount schedule for ordering SMSCaster E-Marketer. Customers who order version 2 are entitled free upgrade throughout the same major version releases. So don't miss the early bird bonus for the discount.